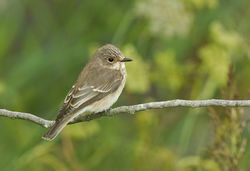 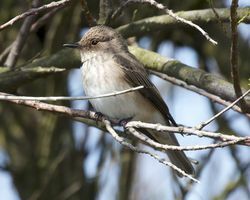 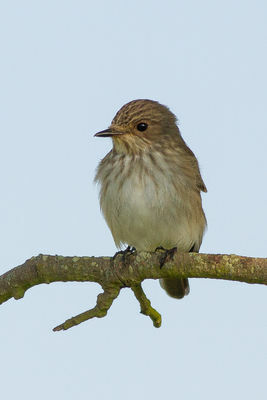 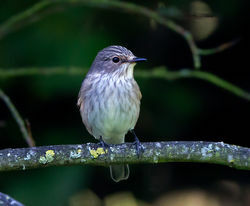 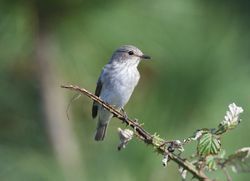 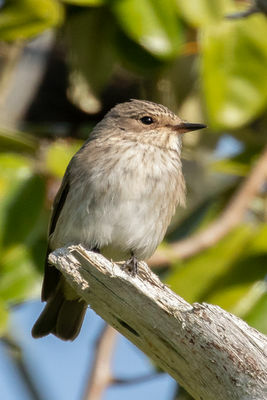 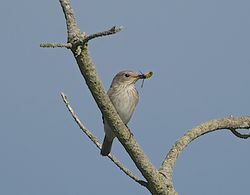 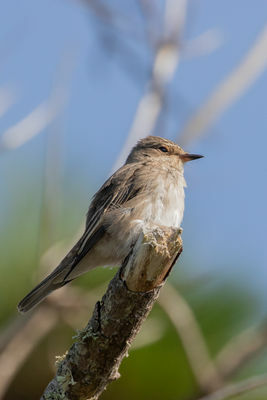 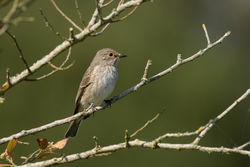 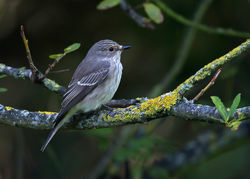 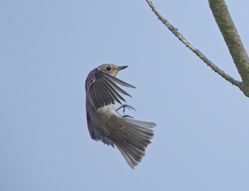 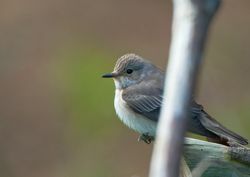 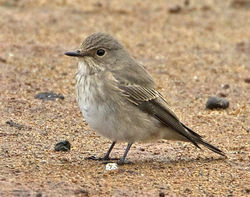 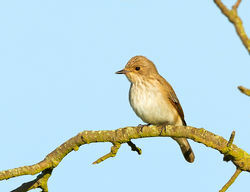 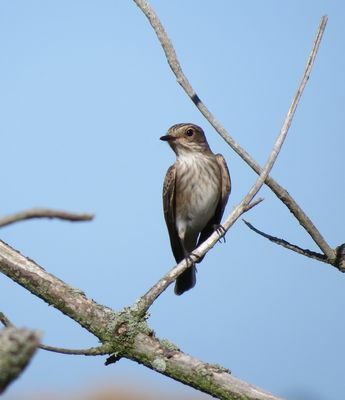 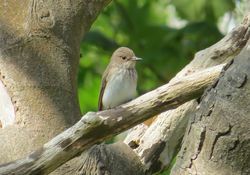 Spotted Flycatchers are widespread across much Europe breeding from Morocco and the Atlantic coasts to beyond Lake Baikal. 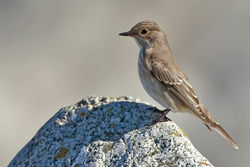 In western Europe, its stronghold in in the north of the range in Russia, Finland, Belarus and Sweden. 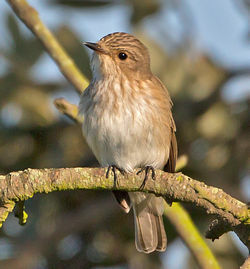 In the UK, this species has undergone a rapid decline. 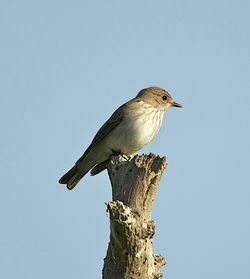 For 1878, he astutely remarks that he did not see so many in 1866 and that 'this was probably owing to one of those accidents of wind and weather which render migratory birds generally less numerous in some years than they are in others...'. 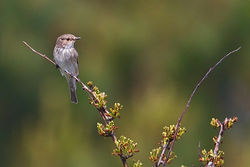 He describes them as 'perhaps being a little local in their distribution avoiding to a great extent places such as the Vale and the open ground on the cliffs, but in all the gardens and orchards it is very common'. 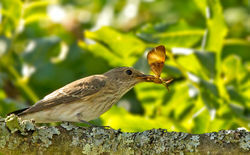 There are few significant historical records since. 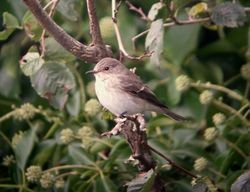 The 1989-91 Guernsey Breeding Bird Survey recorded pairs breeding in 15 out of the 23 squares covered and it is likely that the number of breeding pairs has been significantly reduced since then. 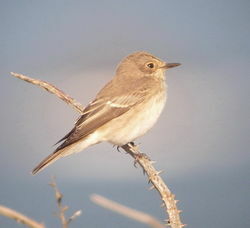 A dozen pairs were found in 1990 (GBN). 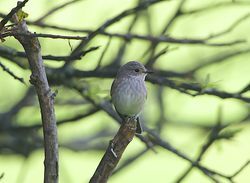 Breeding birds are associated with areas in which tall mature trees are present. 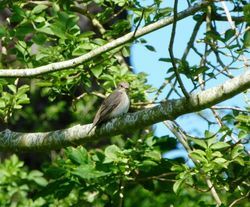 Between 1993-1998, birds have been recorded during June from Saumarez and Cambridge Parks, Talbot, Fauxquet and the Quanteraine Valleys, Le Guet, Petit Bot, Le Foulon and the Heritage Walk. 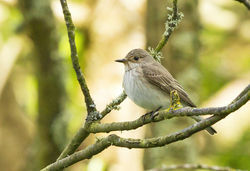 At a best estimate, 10-50 pairs now breed in Guernsey but the exact number remains unclear. 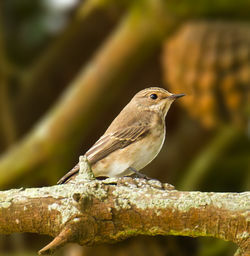 It is likely that some pairs will be missed in the larger gardens in the higher parishes. 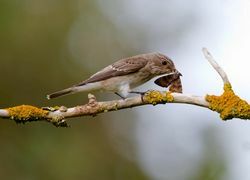 The loss of orchards and the introduction of Dutch Elm disease and the subsequent, almost total, loss of elms from hedgerows will have reduced the suitability of the wider countryside to this species. 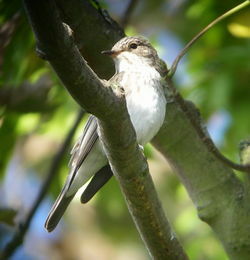 Populations of this species have also undergone a very large decline in Britain but not on the European continent. 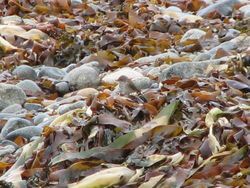 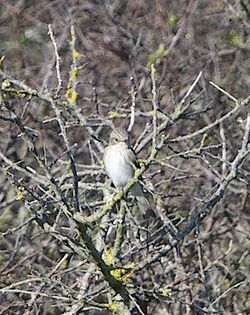 The reasons for this are unknown but factors in the wintering areas may be important for the British, and possibly Bailiwick, populations. 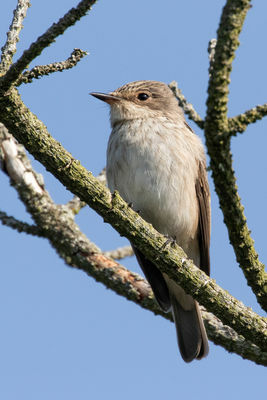 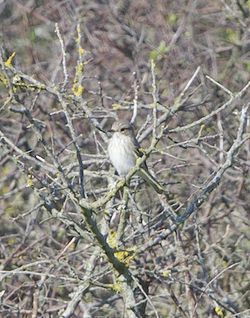 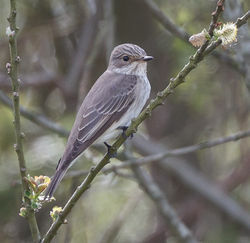 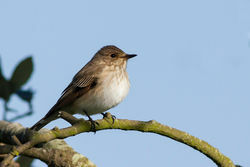 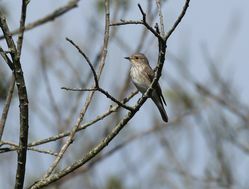 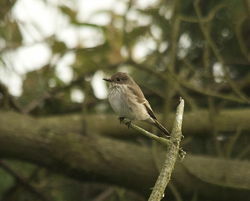 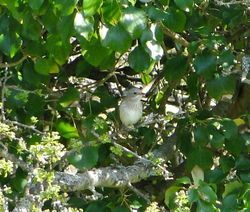 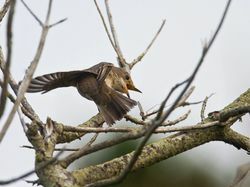 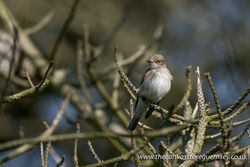 Spotted Flycatchers are, however, a reasonably common migrant in the Bailiwick and a similar number of records are received in spring and autumn. 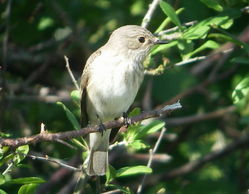 Between 1993 and 1999 records were received from approximately 50 sites. 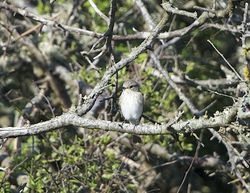 However, when looking at records of birds from coastal areas it can be seen that more migrants tend to be recorded in autumn than in spring. 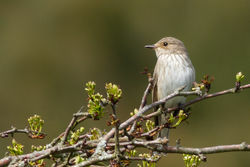 In spring, the first returning birds are found in the last ten days of April or in the first week of May and migration continues throughout May and early June. 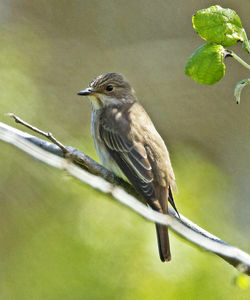 By mid-June most of the records are presumed to be of breeding or over-summering birds. 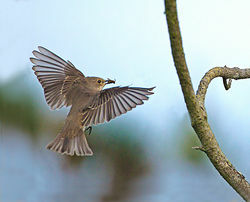 In autumn, migration starts at the beginning of August and occurs over a protracted period, peaking in the middle two weeks of September. 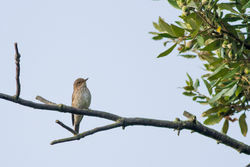 Few birds are seen in October. 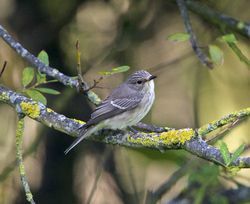 On migration, birds are seen at the usual migrant spots and are regularly recorded on all the major coastal headlands, especially those with stands of coniferous trees. 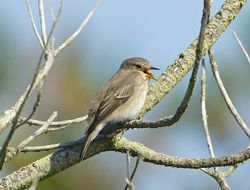 Birds are often seen in pines at Pleinmont, Le Guet, Icart and the Reservoir. 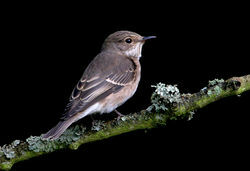 Inland records during migration are also common and birds are regularly recorded in large gardens, parks and areas of woodland. 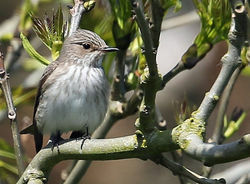 Occasional falls can occur and many birds can occur at one site; for example, on 16-17 May 1984, 55 birds were ringed at La Fougeraie in Sark. 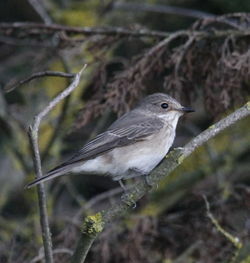 This is exceptional but up to 10 birds can regularly occur at one site whilst on migration.